I need to speak with someone about my child’s experience at summer camp. Who do I contact? 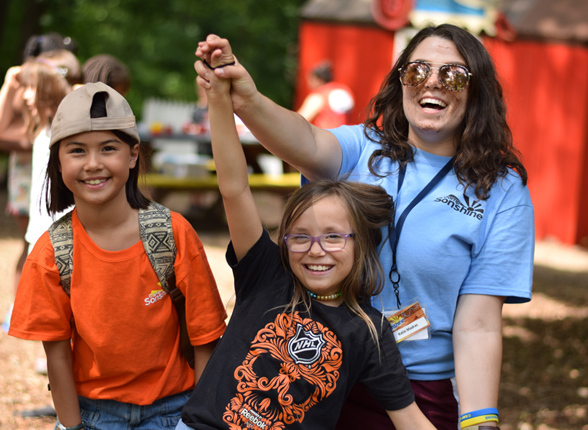 During the summer months, Camp Sonshine’s top priorities include fostering a fun, safe, engaging and nurturing environment for our campers and supporting our Camp families. Our Parent Liaison, Megan Ford, will be available via email or phone if you have questions or concerns about your camper’s experience. *Need help with your account, registration, or finances? Please contact Parent Services. What are Theme Days at SHINE? Theme days are typically on an early release day (see page 10). During theme days, children participate in a variety of activities around a central theme or event. In the past, we have had themes such as Olympics, Birthday Party, and Mad Science. Activities are typically geared for kindergarten through fifth grade, however, middle school students may adapt the theme to their activities as well. Homework is not necessarily scheduled on these days and special snacks are usually served. What are Friday Clubs at SHINE? Is there an opportunity for children to work on homework while at SHINE? Each age group has a designated homework time Monday-Thursday. Each group has a trained staff member with them to be available for any homework assistance. Kindergarten through 5th grade has 40 minutes a day, while middle school has 70 minutes to accommodate their heavier work load. If a child does not have homework, or if they finish their work early, SHINE asks each child to participate in 20 minutes of silent reading. What if there is a snow day? Is SHINE open? As long as the federal government remains open, SHINE will try their best to open and remain open until 6:30 pm. Is SHINE open when Montgomery County Public Schools are closed? and snow days when the federal government closes. During full days, SHINE goes on field trips from 10am-2:30 pm. Some previous trips have included, Port Discovery, Air and Space museum, The Smithsonian, and more! Is there a SHINE discount if my family attended Camp Sonshine? Does SHINE offer a sibling discount? 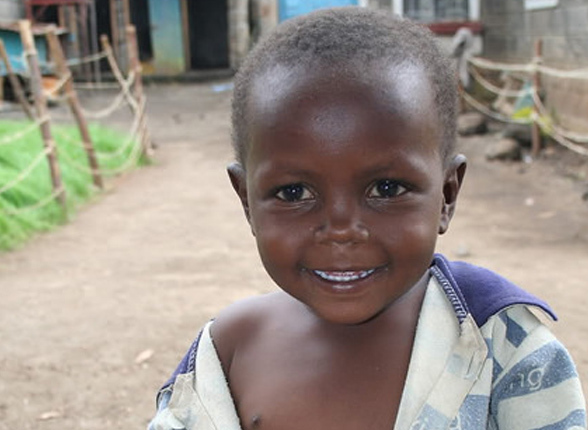 Yes, SHINE offers a $35 discount when both siblings are registered for full-time care. SHINE provides transportation to and from the different Montgomery County Public Schools in Silver Spring and Germantown. If your child’s school is not on our list, do not hesitate to reach out to us and we can look into that school for the future! What are the different attendance options? SHINE offers 2 day, 3 day, 4 day, and 5 day options, AM only, PM only, or both AM+PM for your convenience. What time does SHINE open and what time does it close? How to decide which summer program is best for my child(ren)? Campers will experience artistic, mathematical, and architectural design in a fun way; explore the basic concepts of physics. Partnering with Code Kingdoms, campers will learn about building and coding concepts such as methods, global variables, and constructors. Note: It is also our policy that staff are not alone with campers one-on-one, unless within ear/eye-shot of another. What should I do if I need to pick up my child early from camp? If you need to pick up your child early (i.e., before 3:30 PM), please call Parent Services 24 hours in advance to arrange an early pick-up. NOTE: Early pick-ups are only allowed before 3:30PM. Please note that campers often go off-grounds on field trips. Be sure to check your child’s schedule in the case of early pick-up. If you need to pick your child up early on a day that they’re on a field trip, you may meet your child’s group at the field trip location. What should I do if I drop my child off late to camp? If you arrive at Camp after 9:30, check-in your child at our office in Room 3 at Neelsville Presbyterian Church (at the back of the church building). We will take your child to his or her group. Be sure to check your child’s schedule when you need to drop your child off after the normal arrival time. We will not have alternate activities for your child if they arrive while their group is off-grounds. You may, however, meet your child’s group at their field trip location. Stormy or Code Purple days are often considered Outside/In Days at Camp. In the event of an Outside/In Day, some groups follow their same schedule indoors, while others go on closely-supervised trips. There will be attendants directing traffic in the parking lots for parents who drop off and pick up their child(ren). Sometimes you will hear it announced in the district as a Code Red Day, but that doesn’t necessarily mean it is Code Red in our woods. Our wooded area at Camp is about 10 degrees cooler than the temperature out in the open. When it is declared a Code Red Day, we conduct a review with our counselors, may move certain activities indoors or into the shade, and encourage groups to drink lots of water and take breaks inside. How do I change my child’s swim level? If you need to adjust your child’s swim level, please call Parent Services (301) 989-CAMP. How do I know if Camp Sonshine is a good fit for my child? We recommend taking a little time to get to know us. We are here year-round to serve you and your family. After reading through our website, please feel free to give us a call at (301) 989-CAMP. We’d be happy to speak with you and answer any questions you may have. What should children bring to camp? On a typical day, it’s best to send your camper with a lunch (we are unable to provide refrigeration at this time), water bottle, swimming clothes, towel, and perhaps an extra pair of clothes, depending on your camper’s age. Also, please remember that open-toed shoes or sandals are not permitted. We recommend sneakers to help keep feet safe. What’s the required footwear for camp? Please send your camper with closed-toe and closed-heel shoes. Sneakers (aka tennis shoes) work really well. Although Crocs and athletic sandals are very popular and comfortable, we’ve found that they do not adequately protect campers’ feet during typical camp activities. During water activities we recommend your child wears closed-toe water shoes. What are typical group sizes at Camp? Your child will be placed in a group with other campers in their grade and same gender (1st Grade and up). Although we provide early morning extended care beginning at 7:00 AM, most campers arrive around 8:45 AM. After spending a little time with their counselor, campers head off to our amazing assemblies to participate in game shows, skits and more. Or they might go to their first activity, such as archery or go-karts. After a couple more activity periods, they’ll stop to eat lunch as a group. In the afternoon, older campers will often head off grounds on a field trip. On our legendary theme days, most campers enjoy special activities that lead them from one adventure to another. By 4:00 PM, we’ve accomplished our task of making incredible memories all day long, and we have the happy, tired, and usually dirty campers to prove it. We also provide afternoon extended care until 6:30 PM for parents who need a little extra time to pick up their kids. For more information about our programs (and to view sample activities schedules) please visit our Resource Center where you can download a copy of our Program Guide. Please contact Parent Services if you would like additional information about our programs and services. 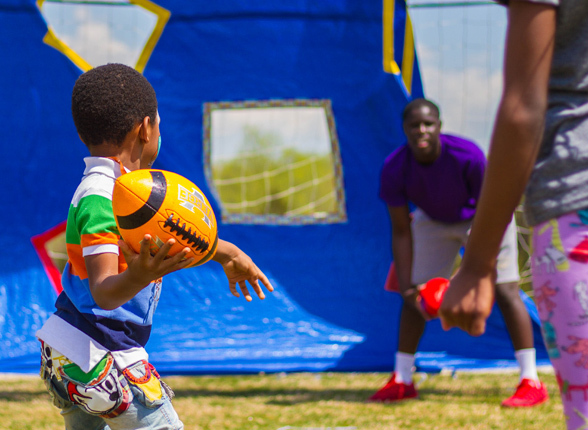 Yes, we offer transportation to and from our Silver Spring and Germantown camps. We have an extensive list of bus stops throughout Montgomery, Howard, Frederick and PG counties. The majority of our bus drivers come from Montgomery County Public Schools, and all of our buses are supervised by Bus Counselors. More information can be found in your Parent Guide. Many kids come to Camp without knowing anyone else. That’s why we train our staff to not only make kids feel welcome, but to introduce them to new friends using friendly “get to know you” games and activities. We have designated times in every camper’s schedule to connect with their group at the beginning of each week. It’s our mission for every camper to have at least one new friend by the end of the first day. Do you have a financial assistance program? Yes. 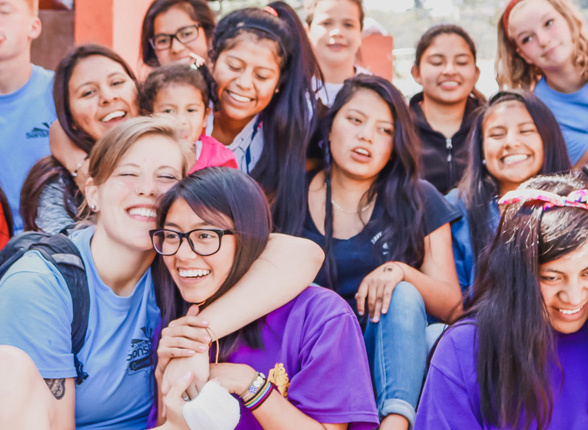 We are thankful to be able to offer a limited number of partial scholarships each summer because of the generous gifts from our Camp families and friends. There is an application process to verify eligible candidates. Please contact our Financial Assistance Coordinator Katelin Freeman to receive instructions on how to apply! Do you offer before/after camp care? Yes! Our Silver Spring, Germantown, Olney and Columbia Extended Care program is available beginning at 7:00 AM and ending at 6:30 PM each day. We recommend that campers bring their lunch in a soft cooler bag or brown paper bag. We don’t have facilities to keep food cold or to warm food up. We do, however, offer a Snack Shack where campers can purchase snack items during their lunch period. How old do campers have to be? 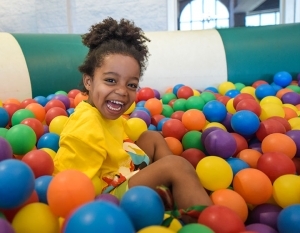 We have programs for campers beginning at age 3. Campers are grouped according to the grade they have just completed. Do I need to contact camp if my child will be absent? We take careful daily attendance; therefore, please do not feel obligated to call if your child will be absent. How do I authorize my child to walk home from the bus stop/camp? If a parent or guardian would like their camper to have permission to walk home from the bus stop or our campgrounds, we must have a signed waiver on file (download a copy of our Walker Consent and Release form). Otherwise, a parent/guardian or designated adult with a Camp Sonshine Parking Pass must be waiting to meet the child at the stop. How do I add a week of camp after I have already registered? Adding a week is easy! Call Parent Services at 301-989-CAMP (2267) to speak with a representative. We’d be happy to enroll your child in an additional week of camp, space permitting. How much money should I send with my camper for the Camp Store and Snack Shack? The amount of money you send with your camper is completely up to your personal discretion. Most parents typically send their child with $5-$10 in a labeled envelope. Please reference your child’s schedule to see when their group visits the Camp Store. Does Camp Sonshine have a religious affiliation? Camp Sonshine is a Christian Day Camp. 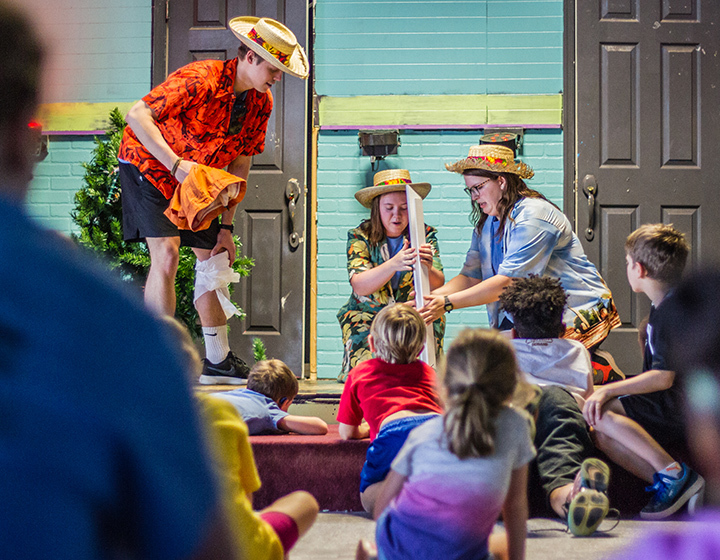 We reinforce Christian values and morals through our songs, skits, and story times. We hire Camp staff from many different Christian colleges and universities all over the country. While we seek to be examples of God’s love towards our campers and Camp families in a fun, nonthreatening way, we are open to all campers regardless of religious affiliation. 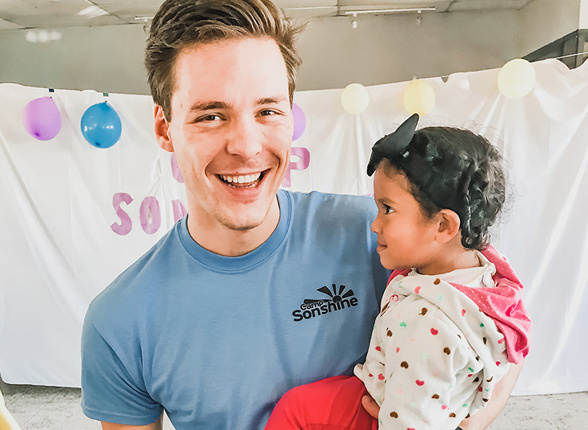 Many families of various different religious and non-religious backgrounds feel comfortable sending their children to Camp Sonshine, and have for many years! What if my child has to take medication while at camp? If your child needs to take medication during the camp day or on an Overnighter, we must have a completed Drug Authorization Form on file. Please visit our Parent Guide for more medication information. Camp Sonshine provides a full-time First Aid Station, and key staff members are trained in CPR and First Aid. A signed Drug Authorization Form is required. Please send your child with a hip pack containing their emergency medication each day. All leadership staff are given an emergency medication list so that they are aware of which campers have emergency medication on them. Please review our Parent Guide (can be accessed via our Resource Center) for more medication-related information. Overnighters are on the Friday of weeks 2, 4, 5, 6, 8, and 10 for 3rd-6th grade campers, and Thursdays of weeks 1-8 for 7th-10th grade campers. Campers will participate in special activities and food will be provided. Campers are picked up Saturday morning at 8AM for 3rd-6th grade campers, and Fridays at 10PM for 7th-10th grade campers. Overnighters are optional for 3rd-4th grade campers, and the cost is $40. Overnighter costs are included in the price of tuition for campers 5th grade and up. Latestay is a special time on the Thursday of weeks 2, 4, 5, 6, 8, and 10 when PreK-2nd grade campers can stay at Camp until 8PM. Campers participate in awesome themed activities, a tractor ride, and roasting s’mores! Latestays are optional and the cost is $25. Dinner is provided. What are Group Time and Theme Day on my camper’s schedule? 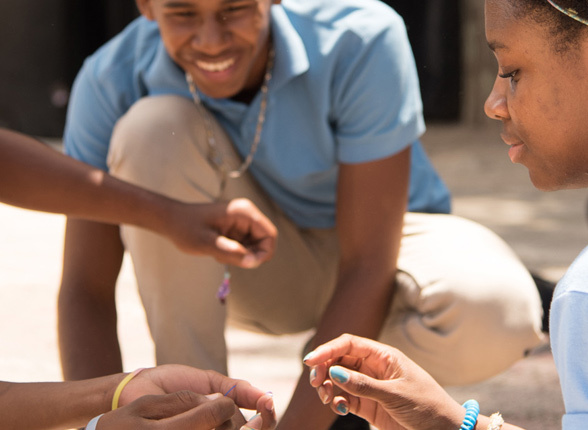 Group Time: A designated time for counselor-led activities. These activities can be things like scavenger hunts, water tag, or puppet making. Theme Day: A fun-filled day of group activities focused on the theme of the week. In the past, we’ve had activities such as pony rides, luau parties, and informational visits from the local fire and police departments. Do all campers go off campgrounds to pools and field trip locations? No. Our Discovery campers (Pre-K and Kindergarten) at both our Silver Spring and Germantown camp locations do not go to swimming pools. Silver Spring Discovery campers do not go on any off campground trips. 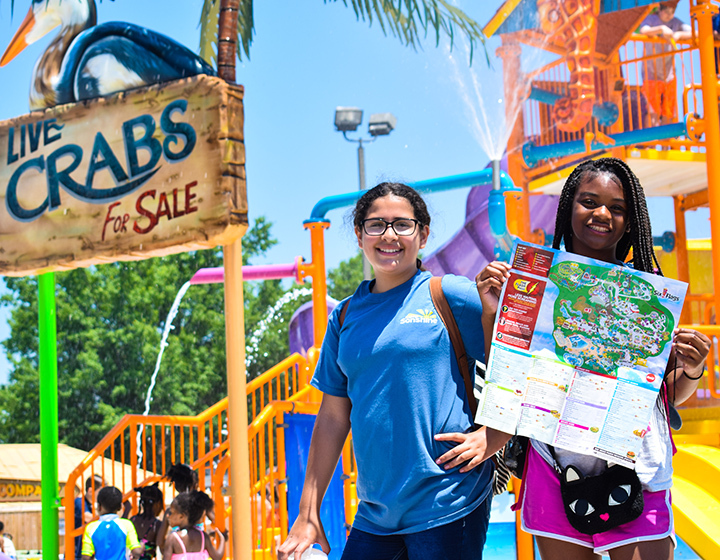 Due to the nature of the programming at these camps, Germantown and Extended Seasons Discovery campers will continue to go on local, non-swimming field trips. 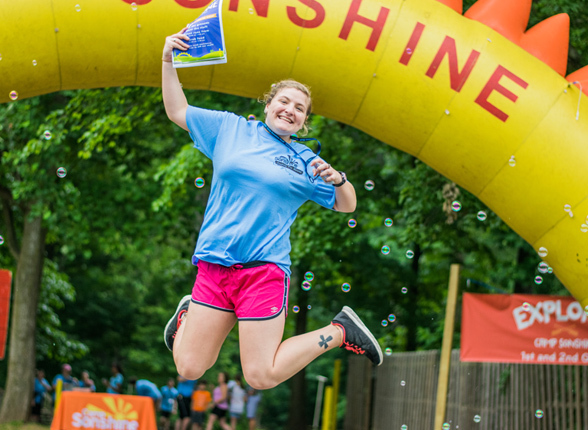 At Camp Sonshine Maryland, we are committed to providing a safe and fun environment for our campers. After careful consideration, Camp Sonshine is an ALLERGY AWARE camp. Camp Sonshine will not serve—or make available for purchase via our vending machines or Snack Shack—any nut-related products. A growing number of children are allergic to peanuts/nuts. Children with peanut/nut allergies who are exposed to foods containing peanuts/nuts may experience life-threatening allergic reactions requiring emergency medical treatment. To reduce the chance of this occurring, we are asking parents to partner with us as we move forward. Pack nut-free lunches for their children. Ensure their child(ren)’s hands and face have been thoroughly washed before entering our campgrounds if foods with nuts (e.g., peanut butter and jelly sandwiches) are consumed before arriving at camp. Even trace amounts of peanut/nut can cause an allergic reaction. Make sure that their children are allergy-aware and avoid foods that are unsafe for them, as we do travel to field trip locations that are not nut-free. Parents should remind their child(ren) to immediately tell an adult if they are experiencing symptoms of a reaction, not to trade foods with other campers, and to only eat foods that have been identified as safe. If you have any questions, please feel free to contact Parent Services. They’re more than happy to assist you. Can I register for camp over the phone? For licensing and legal reasons we cannot receive registrations over the phone. Registrations can be completed online, in person (paper application) or can be submitted via fax/mail/email (scanned PDF). How do I schedule a tour of your camp grounds? To schedule a tour of our camp grounds, please call Parent Services. Our 1st week of Camp starts June 17th. We offer 11 consecutive weeks of Summer Camp. Where do I find my camper’s schedule and field trip information? Schedules and field trip information will be posted in the Resource Center. We will also have hard copies of our schedules when you drop your child off at Camp. Why should our family choose Camp Sonshine? 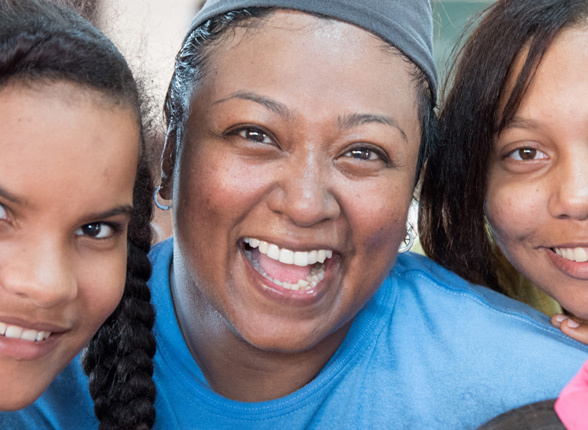 For more than 30 years, Camp Sonshine has been helping kids be successful in the business of growing up. We create a safe and incredibly fun environment where kids can be themselves, learn new skills, and have excellent role models. We believe that the Camp Sonshine experience will help families raise kids who will become all that God has created them to be. Our daily programming begins at 9 AM until 4:15 PM. Note: We offer AM and PM extended care. Please review our Parent Guide (pg.’s 23-27) for detailed drop-off and pick-up information.